Philippe Yersin has been a PADI member for 28 years. He also has been a TDI/SDI member since 1999. He started his career in 1991 as a Scuba Instructor for Eurodivers in the Maldives where he worked at a resort for two years. He then went to Malaysia where he managed a dive center for the same company for another two years. Then life took him to Paris where he successfully managed scubazen dive school for the next five years. Philippe is a PADI Platinum Course Director. 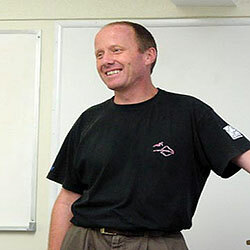 He is also an instructor trainer for PADI Tec Deep and Trimix, DAN, and an Emergency First Response Instructor Trainer. He also holds the rating of Advanced Trimix Instructor Trainer with TDI. He also holds the rating of Full Cave Instructor with TDI. He is also a ITI VIP Instructor Trainer and a Public Safety Diver Instructor. Philippe has done over 9000 dives since 1990. He spends most of his time managing (Eastern Academy of Scuba Education). When he does have free time, Philippe enjoy kayaking, land and underwater photography, and spending time with his Danniff. The Eastern Academy of Scuba Education is a Premier PADI Career Development Center on the East Coast of Florida. Our PADI IDC’S are conducted exclusively by a Platinum Course Director. We offer free meals and accommodations with pool onsite. Our Facility is approved for VA training. New Visual Inspector Instructor Program.